Before—The old air ducts with some of the attic floor removed showing the gray blown in fiberglass that was packed under the floor. After—One of the cleaner metal and foil ducts that replaced the old fiberglass flex ducts. We wrapped the new metal ducts in bubble wrap where insulation was necessary. The house air is now much cleaner. Before—The old fiberglass wrapped flex ducts coming from the old HVAC unit running down into the attic floor. 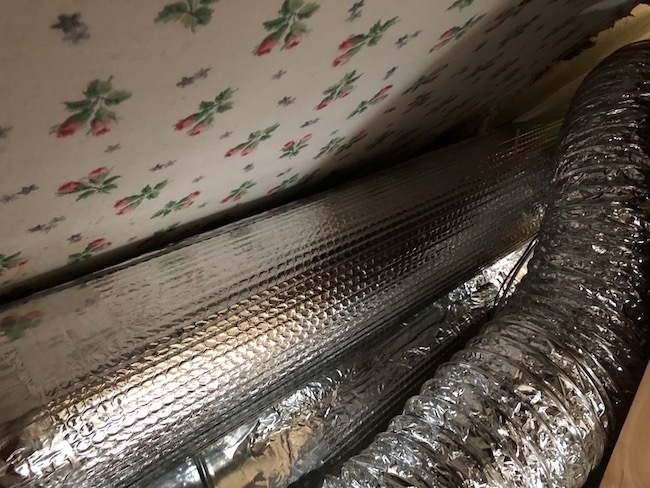 Notice how the contractor never taped off the ends of the flex ducts leaving the fiberglass insulation exposed to the air. 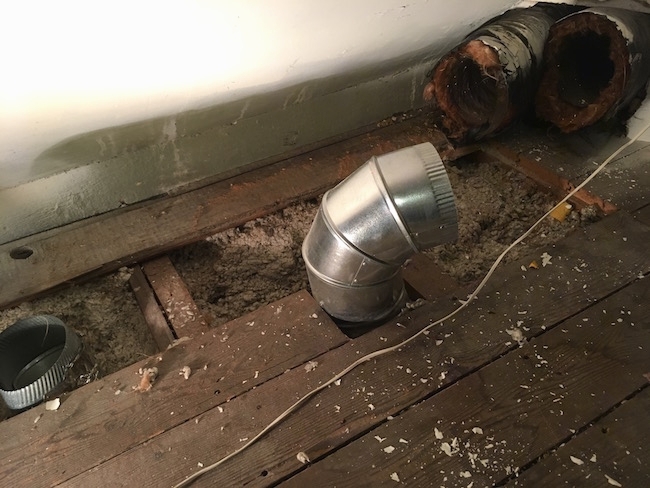 He also had the HVAC system pulling its return air from between the floor joists by simply pushing the blown in fiberglass to the sides to create a space. 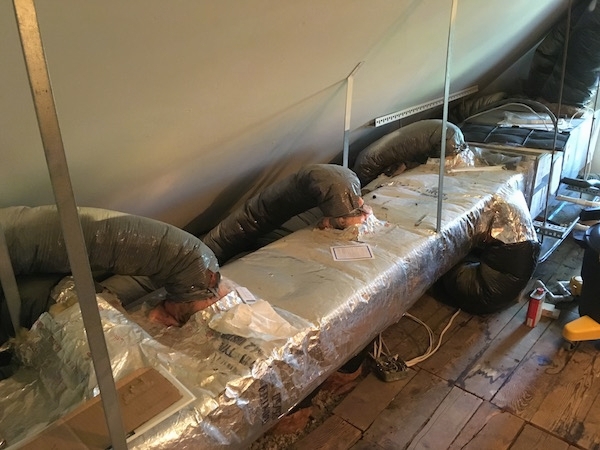 While contractors may be trained in how to cool or warm a home, unfortunately they are not trained in how to also keep the air in the home clean. Some contractors may consider the air quality, but most do not. There are a lot of sick-homes out there. The people living in these houses are sick way more than they should be. If you want a home with decent air quality you must be your own advocate. 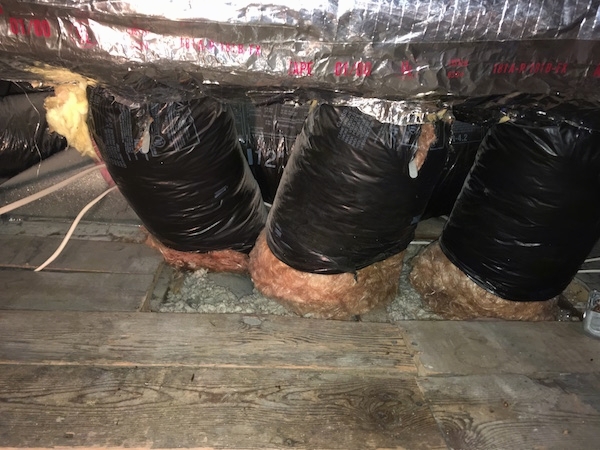 After—The new HVAC system air handler with clean foil ducts that replaced the old fiberglass wrapped flex ducts. 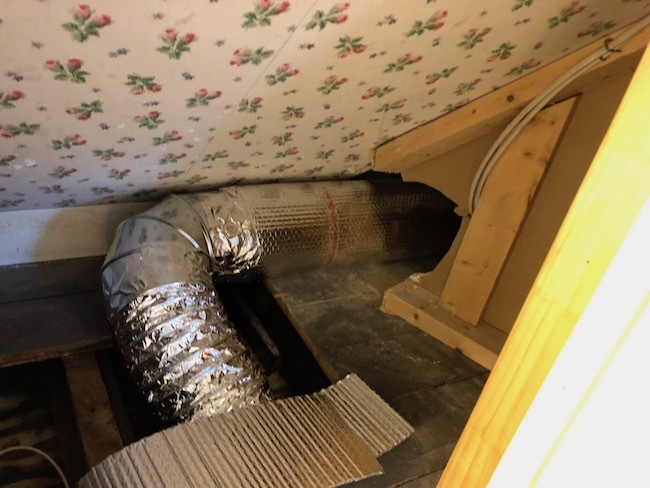 Before—This was the old fiberglass flex ducts and the fiberglass that wrapped the old HVAC system before it was removed. The fiberglass was left exposed. The contractor never taped it off. Do you have exposed fiberglass in your home? After—The new medal and foil ducts that are wrapped in bubble wrap where insulation was needed. Bubble wrap is a much cleaner way to go than using fiberglass. Before—The old HVAC system wrapped in fiberglass insulation. 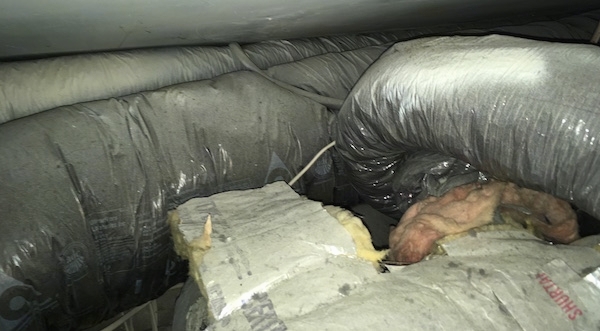 The flex ducts were never taped off at the ends so the pink fiberglass is exposed to the air. After—The house now has heat pumps. This is the air handler wrapped in cleaner bubble wrap insulation. We had the fiberglass inside the air handler removed and replaced with a black foam. We are going as fiberglass-free as possible. It is not an easy task. It is a bit shocking at just how much fiberglass is inside the average home. Since we have removed the fiberglass from our own home, a lot of our ailments that we had for decades have gone away. All this time a lot of our sicknesses were caused by poor indoor air. Doctor after doctor would ask about our diet, amount of exercise and sleep patterns. Not once was air ever mentioned. Be your own clean air advocate. How is the air in your home and workplace?